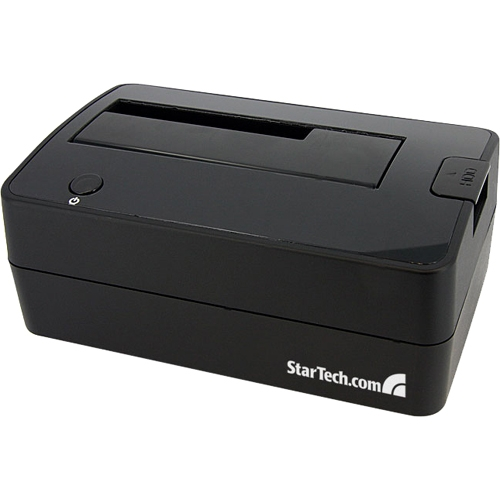 The SATDOCKU3S USB 3.0 Hard Drive Docking Station delivers full, instant access to any 2.5in or 3.5in SATA (SATA, SATA II, SATA III) hard drive (HDD) or solid state drive (SSD), without having to mount the drive in a computer or install it in an external enclosure. Large capacity drives (tested with up to 4TB) can be used to greatly enhance your computer's storage/backup capabilities. Relying on the outstanding data throughput support of USB 3.0, the HDD docking station is capable of transfer speed up 5Gbps, making it the fastest way to access data from an external drive. Double the value of this hard drive docking station, using a SATA to IDE hard drive adapter (SAT2IDEADP), which enables you to use any 2.5 or 3.5in IDE hard drive in a SATA hard drive dock slot.